Outdoor Wedding Venue located 20 minutes west of Little Rock with a breathtaking view of Pinnacle Mountain and Lake Maumelle Your guests will never forget the moment you both said "I do" at your Enchanting wedding. 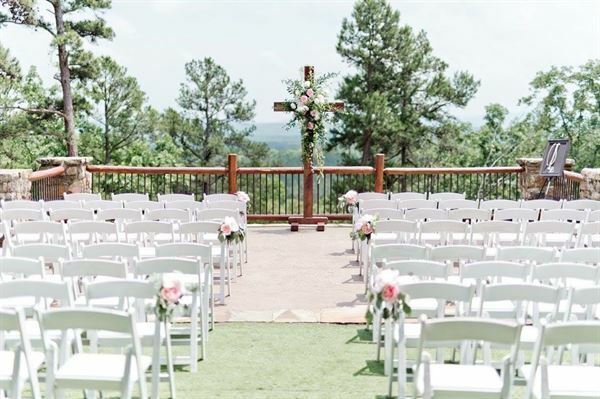 You will have acres of stunning property with the natural beauty of Pinnacle Mountain and Lake maumelle providng the perfect backdrop to your ceremony. We provide classic white seating for your guests and opportunities for taking breath taking pictures are numerous in our beautiful outdoor setting. Ceremoney, Reception, and Honemoon Cabin are all conveniently located on the property. All venue rental rates include the following amenities: • Access to outdoor areas on 20 acres property • 20 - 42inch Round Tables • 120 - White Folding Wedding Chairs • 80 - Patio Chairs • 4 - White Pillars • 1 - Bronze Arch • Soda Fountain with Coke products • Commercial Ice Machine • Refrigerator, Stove, Barbecue Grill, Microwave, and Coffee Pot • 2 six foot folding tables, 1 eight foot folding table • Outdoor sound system: CD player, AUX connection, and Radio "An Enchanting Friday Wedding" | $1,800 + 9.5% tax This includes: Availability to the venue from 10:00 am to 10:00 pm on Friday Honeymoon Cabin Rental on Friday evening "An Enchanting Saturday Wedding" | $2,800 + 9.5% tax This includes: Availability to the venue from 10:00 am to 10:00 pm on Saturday Honeymoon Cabin Rental on Saturday evening "An Enchanting Sunday Wedding" | $1,800 + 9.5% tax This includes: Availability to the venue from 10:00 am to 10:00 pm on Sunday Honeymoon Cabin Rental on Sunday evening Note: This package is used for Holidays that fall on Monday through Thursday "An Enchanting Weekday Event by the Hour " | $600 for first 3 hours + $100 per additional hour + 8.5% tax (minimum three hours) This includes availability to the wedding venue for events Monday through Thursday (not available on Holidays).